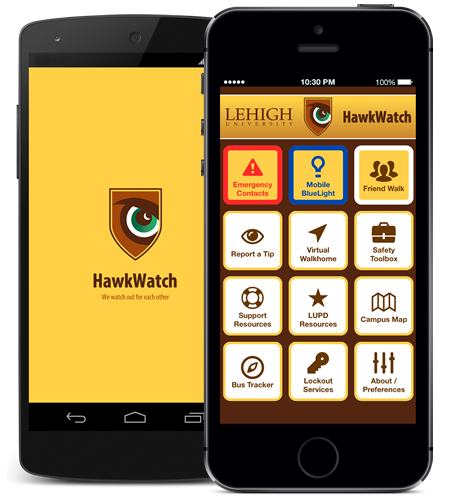 The HawkWatch personal safety app is the official mobile app from Lehigh University and is offered for free to all members of the campus community. There is no obligation to download this app. The HawkWatch app is custom-designed for Lehigh University and includes a number of options that can help in an emergency situation. It also puts the user in direct contact with LUPD dispatchers. It is the equivalent of a mobile blue light phone in the palm of the user’s hand. In addition, the app provides quick and easy access to useful information such as directions in emergency situations, and emergency contacts and support resources. It can also serve as a Lehigh bus tracker, provide links for reporting a tip, and offer users a quick and easy way to request safety programs.